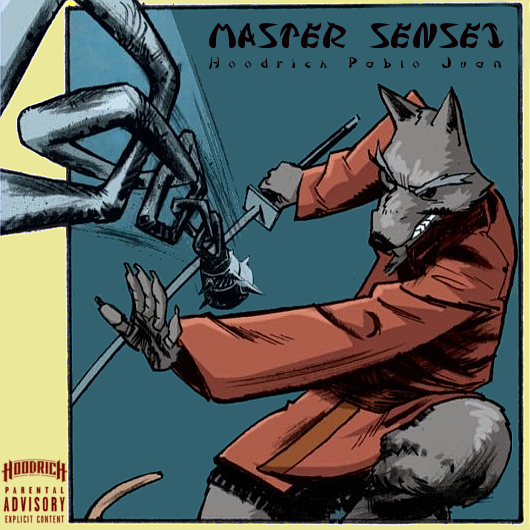 Character Bio - The adoptive father of Leonardo, Donatello, Raphael and Michelangelo, Master Splinter is also their teacher and sensei, training them in the art of ninjitsu so they are able to survive not only a world that will never understand them, but also the attentions of the murderous Shredder and his Foot Clan. Protective of his sons - perhaps overly so - as well as sage and wise, Splinter always advises caution, and will go to whatever lengths necessary to defend his family. As a figure with a secret identity, Master Splinter has these Secret Identity Synergies. As a Wise figure, Master Splinter has these Wise Synergies. Master Splinter may use his The Way Of Ninjitsu special power to add a skull, shield or 4 to the roll of any Ninja Turtles you control. When a Unique Ninja Turtle Hero you control is destroyed, you may activate Master Splinter’s Father's Devotion special power. As a figure with a secret identity, Master Splinter interacts differently with these special powers. As a Wise figure, Master Splinter interacts differently with these special powers. Tiny and huge figures are not affected by Master Splinter's Breaking Balance special power. Last edited by Ronin; December 31st, 2018 at 06:09 PM. Once per round, after any attack dice, defense dice, or the 20-sided die is rolled for Splinter or a Ninja Turtle you control, you may add or subtract a skull, shield, or 4 from that roll. If a Ninja Turtle you control is destroyed by an opponent's figure, you may place any unrevealed Order Markers from its card on this card and, if Splinter is unengaged, you may immediately place him on an empty shadow tile or any empty space within 3 spaces of the destroyed Ninja Turtle's previous placement. For the rest of the round, when Splinter attacks, he may attack one additional time. When attacking an opponent's adjacent figure with a normal attack, or when defending against a normal attack from an adjacent figure, if the opponent rolls more skulls than shields and Splinter is not destroyed, you may inflict a wound on that figure. Tiny and huge figures are not affected by Breaking Balance. Last edited by Lazy Orang; December 9th, 2018 at 02:11 PM. Once per round, after any attack dice, defense dice, or the 20-sided die is rolled for Master Splinter or a Ninja Turtle you control, you may add or subtract a skull, shield, or 4 from that roll. If a Ninja Turtle you control is destroyed by an opponent's figure, you may place any unrevealed Order Markers from its card on this card and, if Splinter is unengaged, you may immediately place him on any empty shadow space that is a shadow space or is within 3 spaces of the destroyed Ninja Turtle's previous placement. 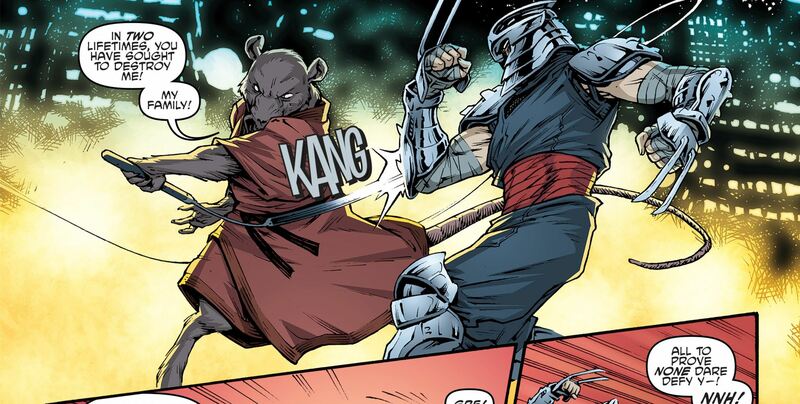 For the rest of the round, when Splinter attacks, he may attack one additional time. When attacking an opponent's adjacent figure with a normal attack, or when defending against a normal attack from an adjacent figure, if the opponent rolls more skulls than shields and Master Splinter is not destroyed, you may inflict a wound on that figure. Tiny and huge figures are not affected by Breaking Balance. If a Ninja Turtle you control is destroyed by an opponent's figure, you may place any unrevealed Order Markers from its card on this card and, if Splinter is unengaged, you may immediately place him on any empty space that is a shadow space or is within 3 spaces of the destroyed Ninja Turtle's previous placement. For the rest of the round, when Splinter attacks, he may attack one additional time. If a Ninja Turtle you control is destroyed by an opponent's figure, you may place any unrevealed Order Markers from its card on this card and, if Splinter is unengaged, you may immediately place him on an empty shadow tile or within 3 spaces of the destroyed Ninja Turtle's previous placement. For the rest of the round, when Splinter attacks, he may attack one additional time. Last edited by Lazy Orang; March 21st, 2018 at 08:12 AM. I feel like all 3 of these powers are 2 or more powers crammed into one. Some streamlining may be in order. FATHER’S DEVOTION seems like a bit of a theme break to me unless the Turtles are wounded. He’s trained them to fight, I don’t really see him stepping in and taking over unless a turtle is thoroughly beaten and about to be killed. I also don’t think he needs the extra attack die with everything going on in Master of Ninjitsu. I see what you’re trying to do in Master of Ninjitsu, but I think all the rerolling is just confusing. Maybe find a simpler boost than rerolling (which requires a lot of verbiage) or only leave it on attacking and bump his defense to 6. Father's Devotion is, IMO, the most important power here - it's what cements the theme to me, and I would like to keep both aspects of you. That being said, I can see making the protection limited to Turtles with, say, 2 or more wounds on their card. Wisdom of the Rat literally is two powers smashed together - he originally had Ninja Focus from Leo as a separate power, but someone suggested putting them together. I'd be happy separating them, especially since Leo has 4 powers. With Master of Ninjitsu, I really would like the effect to trigger on both attack and defence, as I essentially want this to be a twist on MMA. Really, though, I'm not super set on the re-roll, I just want it to be a boost based on the opponent rolling skulls to represent them being 'off balanced'. I tend to agree here and actually Splinter with a High defense and lower life makes sense here. He is hard to hit but in the end he is fragile if he misses his dodge. Higher Defense with straight Counter Strike would be great. Wisdom of the Rat is fine and will be useful for the overall team so I don't mind it being two powers since they are both slim short and easy to understand. Break up Ninjistu into 2 powers one offense and one defenese...such as Counter Strike and the move/attack part as the second power. Disagree 100%. It's not that they wouldn't try to, but if he thought it was too dangerous, he'd tell them a stern 'no', one of them would argue for 0.5 seconds, he'd say 'no' again, and they wouldn't dare get involved... too directly. On the other hand, I've definitely seen him stand in the way of Shredder to protect his sons. I do take Margloth's point though - that was generally when they were battered and he was interjecting to save their lives - not coddle them. In the end though, I really want to get across his protectiveness of his sons. I don't want him to just feel like a generic 'Master' - more than that, he is their adoptive parent, and he should play as such. Him saving the OM and bumping their roll seems like pretty fatherly actions to me...If it's the theme of the name use the name there. It isn't the theme of the name, it's the theme of the action. Saving the OM and bumping the roll are all well and good, but it translates, 100% as 'Master', not 'Father' - both distinct feelings that need, IMO, to come across. As their Master, he pushes them to do the best they can and organise themselves as well as they can (saving the OM - it isn't really a protective power, it's there to synergise with Leo's Turtle Power!) - as their father, he does what he can to make sure they don't come to harm at a push - his #1 priority is keeping his sons alive, that's a large part of why he trained them. It is the theme of the mechanics that conveys that he's more than just their martial arts master and sage leader, and conveys a necessary narrative in game. There are a lot of things I am willing to flex on with this design, but I'm sorry, the existance of this power is not one of them - it is the narrative core of the design, and without it, he doesn't feel like their father, to me. I like the design, but I agree that it's going to need a little paring-back. If I had to immediately simplify a little, I'd probably swap out Master of Ninjutsu for MMA and scrap the d20 bit from Wisdom of the Rat (he's already doing three other things for the Turtles). I could see scrapping the D20 bit - mostly I was just bringing in Ninja Focus from Leo since I thought that, if anyone could calm Raph down or get Mikey to focus, it would be Splinter, not Leo. I'd like to keep it, but it's not a big deal. It's also like to try to get a specific Ninjitsu feeling combat power rather than going generic, since I feel that'd be more interesting and unique, and I appreciate it when martial arts training is made a bit more distinct to convey the style (Batroc, I'm looking at you), but, again, not something I'm married to. See that's where we disagree...myself as a father I let my son make mistakes so he can learn something...but the OM save and the bump in the D20 is not a master power it's really only useful for the Turtles as a team in that he as the father knows how to temper Raphael and He has their father knows how to tame the Brash actions and give them that OM back that they lost through there eagerness. I see his card as what he can offer to this specific family and not what he can be the master of. Those powers that the Turtle's have are why these powers link him narrative to them. The current Father power could generically be used as a master of any NINJA and not just the ones he acts as a father too. Your current Fatherly Devotion power could be named Ninja Protection and no one would have any clue that it was to represent him being the father of the TMNT save from the word Turtle being in the power.